For the past few days, I have been working on creating the growth chart pictured above. I didn't use a tutorial, I just used my imagination (which is probably why it took my so long to make it)! 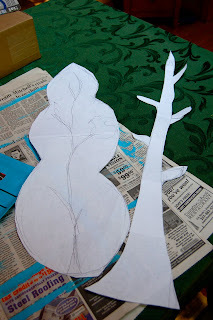 But, since I've already done all of the work, I thought I would show you how to make one of your very own! Take the shade and cut out a piece that is 12" in diameter and about 42" long, being sure to start cutting at the bottom of the shade (the bottom is already 'hemmed' and has the space to for the plastic rod that comes with the shade). -Take your craft paint and paint the entire shade. Mine took about 3 coats. In the future, I would probably try spray painting it as an alternative to see if it was any faster. 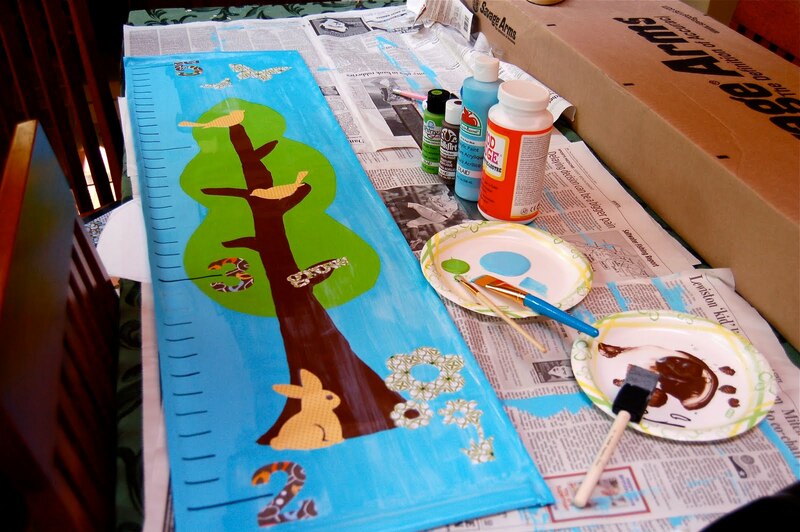 Once the paint is dry, you will need to fold each of the sides 1/2" over to the back and then sew up each side. 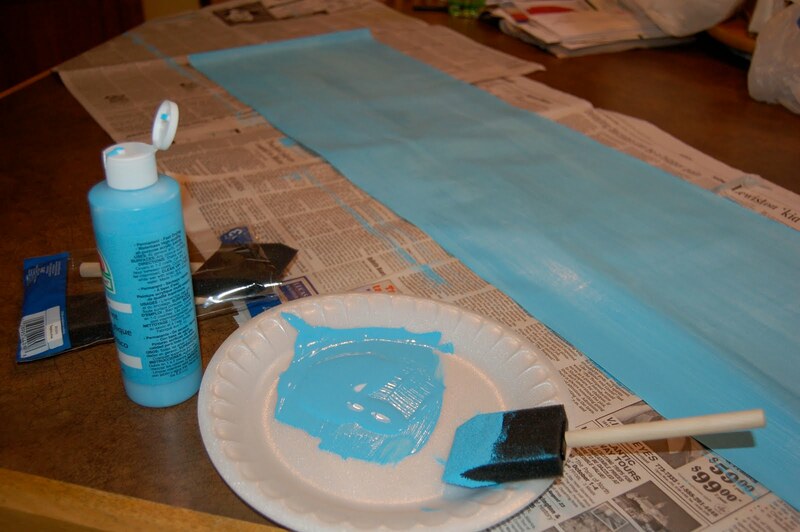 You must do this because after you've painted the vinyl, the sides curl up as they dry. 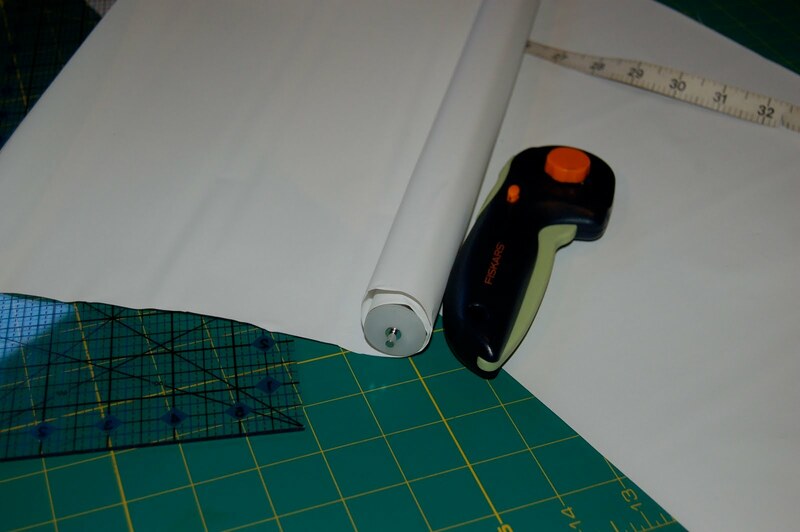 BUT FIRST, you must cut the plastic rod that came in the bottom of the shade to fit the size of your chart bottom and thread it into the bottom BEFORE you sew up each side. 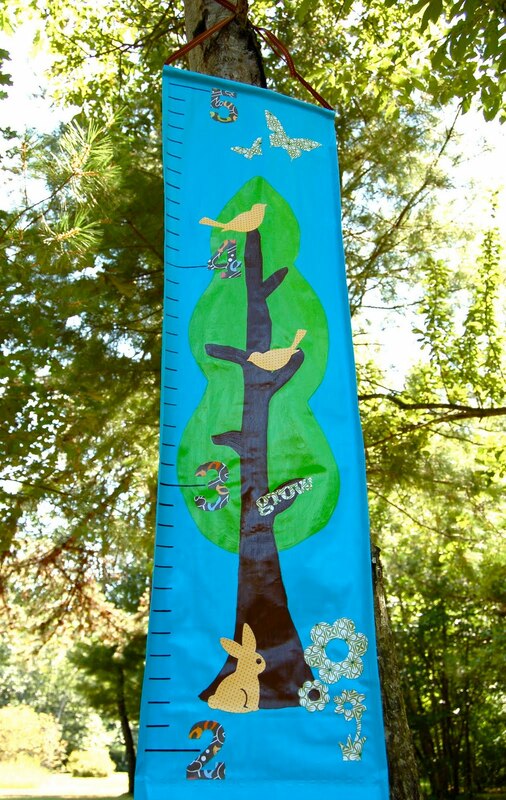 So, it will be the length of your bottom minus a half inch on each side where you will be folding and sewing the sides. Then at the top, fold over 1/2", then 1" and stitch . You are forming a little pocket at the top through which you will thread your ribbon to hang the chart. -Next you can decide what design you'd like to paint on the chart. I chose to paint a simple tree. I used templates cut out of paper because I don't trust myself to do it free hand! Just trace your design on the chart with a light pencil, then paint away! 2 1/2", and my lines to mark the inches were 1/2" each. I used a ruler and a pencil to mark my lines first, then used a black sharpie to mark the lines. Measure twice, draw once!!! I did try using a black paint marker first, but it created a huge mess that I had to go back and fix, so I would just stick with the sharpie! -Once all your lines are done, next is creating the numbers and embellishments. 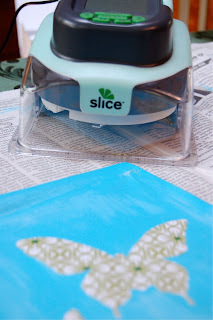 I used scrapbook paper to cut out the numbers with my Slice paper cutting machine. You can also just print numbers and images from your computer on to card stock and then trace onto scrapbook paper and cut out (you know, the old fashioned way)! My numbers were about 3 1/2 inches tall. I chose a nature theme so I also cut out butterflies, birds, flowers, and a rabbit in different papers. 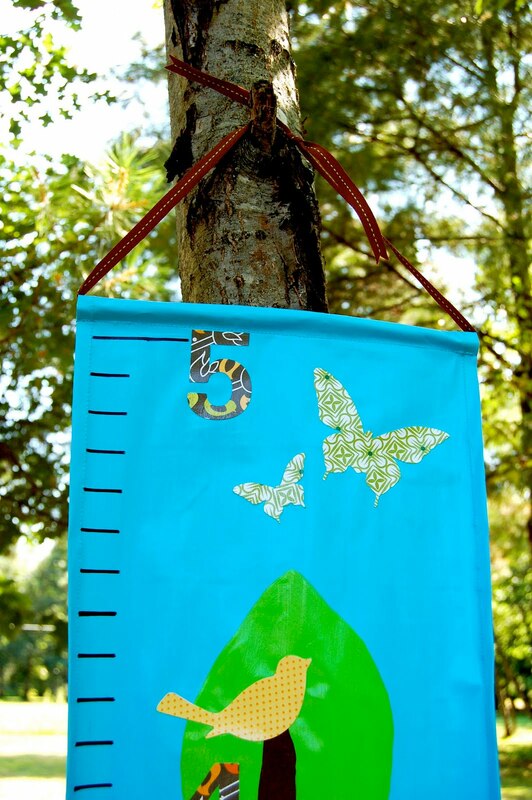 Use Modge Podge to glue the cutouts onto your chart and then spread a thin layer of it all over the entire chart. This will dry clear and act as a sealer. 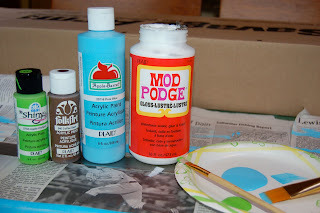 I also used another product from Modge Podge that you spray over the entire thing to seal it up and keep it get rid of the tacky feeling. 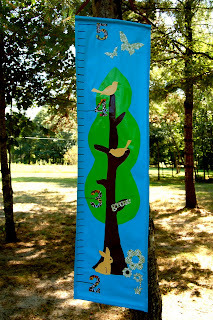 -Use ribbon to thread through the top of the chart, tie in a bow. Then insert either a small wooden dowel or a straight stick from your backyard into the top to keep the sides from bending in when you hang it. Voila! 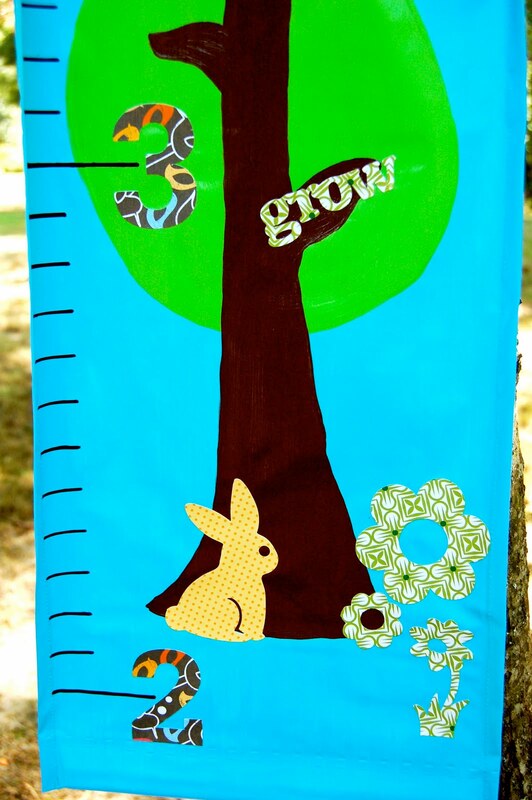 a beautiful and one-of-a-kind growth chart! Alternatively, you could also get a piece of lumber from the hardware store and paint/embellish it just the same...you'd just have to drill two holes at the top to thread the ribbon!